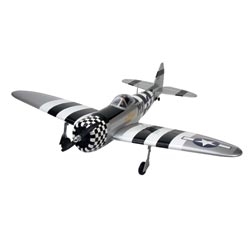 The new Hangar 9 P-47 Thunderbolt 60 ARF has exceptional scale realism and great flight performance. This ARF will include many of the same product features as the other fine scale aircraft in the Hangar 9 lineup. It includes preinstalled retracts and many of the accessories needed to complete the model. This power system setup delivers an excellent balance of thrust and top speed for the P-51. Average duration is approximately 8–15 minutes depending on throttle management. *Conversion may require some minor airframe modifications along with installation of motor mount and motor, electronic speed control, battery tray and battery packs.